Now that it's summer, I spend a lot of time at the house. One of the best ways for me to keep from eating out of boredom is to keep busy! My friend Rachel came over to craft, so I needed to find a project to work on. 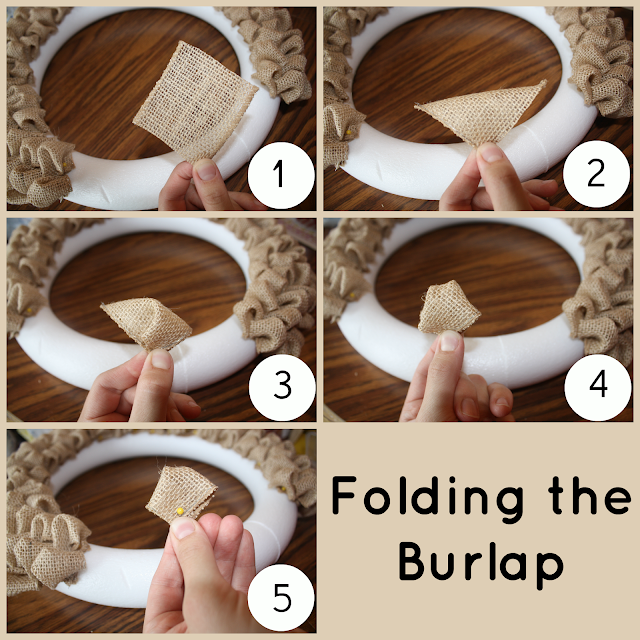 I pulled up my Pinterest crafting board on my phone and found this awesome burlap bubble wreath on Today's Fabulous Finds! I changed it a little and added a few of my own embellishments. 2 jumbo rolls of burlap ribbon - with wired edges. 1. My burlap ribbon was 2.5 inches wide, so I cut it into squares (2.5 x 2.5). I measured one and then used it to cut all the others. Hold a burlap square by the bottom corner. 2. Fold the top corner down to the bottom corner to make a triangle. 3. Pinch the very tip of the right corner of fabric and fold it down to the front. Line up the corners. 4. Pinch the very tip of the left corner of fabric and fold it down to the front. Line of the corners. 5. Put a pin through the layers. Pin it to the foam wreath. Pin them so that they overlap and cover the pins. Keep laying the bubbles until you have covered the wreath. I did not cover the back of the wreath since you won't see that. To make the flower, I started by making 4 bubbles with the chevron burlap. I held them all together and pinned them down to the wreath. I kept making more chevron bubbles and laying them until the flower was the size I wanted it. Then I cut 2 longer rectangles out of the teal burlap. I made a bubble with it and pinned it down under the flower to serve as leaves. I wrapped the leftover red chevron through the wreath and tied a knot at the top to complete the wreath. I've been itching to make one of these - thanks for the great tutorial! Can't wait to get started. Your newest follower! Found you via Homemaker on a Dime - hope you will stop by and follow me too! This is super cute! Saw it on Market Yourself Monday :) Pinning! Chris - I am your newest follower on bloglovin! I love that technique! It creates so much dimension - very cool. This is just beautiful. A wreath is next on my list. I have never made one before. I think I'm in love with this style! I'm pinning! LOVE IT! I've seen tons of burlap wreaths, but this one is beau.ti.ful. Can't wait to try it out. Thanks for posting. This is so cute! I love it, and the chevron burlap is great!! I love this so much!! That chevron burlap ribbon is to die for. Thanks for linking up with Two Girls & a Party! Co-host of this week's Two Girls & a Party linky party! I am in love with this! I'm always envious of people who can make wreaths--mine never turn out this pretty! I love anything with burlap! 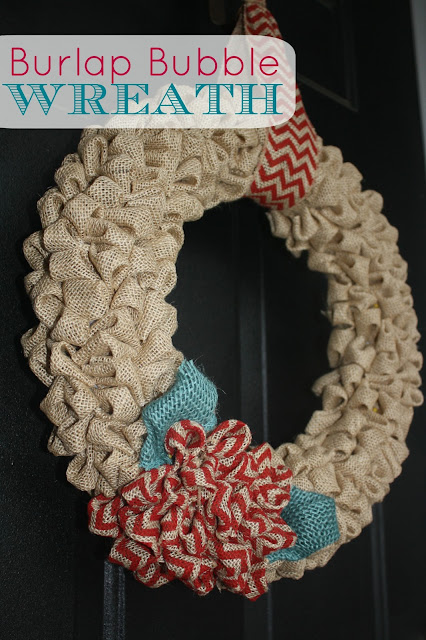 This wreath is great and it is a better alternative to eating! I really love the colors you chose also. Super cute Allison! I have the same cheveron burlap and was going to make a wreath too! I just loved the way yours turned out! Thanks for sharing it on Tell Me Tuesday and you are featured this week! Ahhh - thank you all so much! It was a fun craft. It's one where you find a good movie to watch while you do it. It definitely took a little while to do, but I think was worth it. Make sure to send me pictures if you make one! I'll post them on here. Thank you, thank you! Glad you like it! How long does it take to make??? It was a little time consuming because I made the bubbles so small. It was several hours. I have to assume the smaller the bubbles and more time spent on one of these, neater they are. This by far is one of the nicest , I have seen! Yes - it was a little time consuming. I enjoyed doing it, though. I put on a movie and went to town! Thank you for the compliment! How did you make you flower work? Is it on top of the original burlap as well? Yes - the whole wreath is covered in the regular burlap. Then I just pinned the flower over the other burlap. You could leave an empty spot for it. how big were the squares for the flower, 2.5" as well? Yes... the flower pieces were the same size. The leaves were bigger...no specific measurement. Hi, this is Jennifer, Allison's sister. Allison passed away in 2016 from what started out as the flu. I'd say to give it a try. It may absolutely work. I saw your comment come through because I blog over at thelifeofjenniferdawn.com and her blog is under my account. Just thought I'd reply. Thanks, Gayle. It's been a devastating loss for our family. I've often thought about contributing a final post here to let her readers know. Words keep failing me though.